If you are a mechanical engineering professional and have a twitter account .. we invite you in our mechanical engineering campaign to collaborate on twitter..
Look forward for your presence. 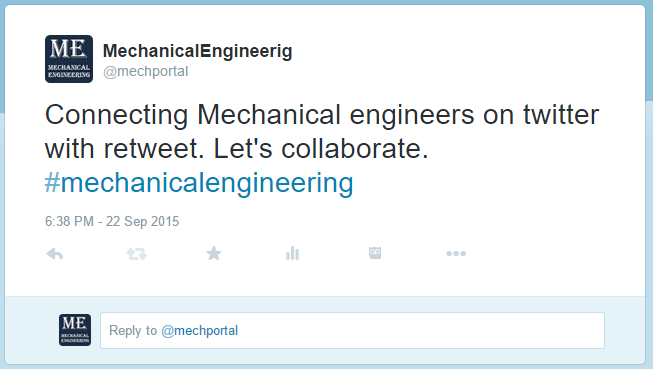 How can there be much collaboration in 140 characters? This is not enough to state clearly what the problem is, much less to propose solutions. I do not see the point. Everybody got that? The word is "s"! No need for even 140 characters, just "s"! Now that, my friends, is real collaboration! The word "collaborate" literally means to "work together." How do you expect this to operate? Most employed engineers are working on the projects of their employers (that is what employment is all about, after all). If they divulge the nature of their projects, without a formal contractual relation with a consultant, they risk being sacked. We really don't want to see anyone out of a job! So I repeat, how do you expect this to work? How can people collaborate?